Can Your Child Benefit from Pilates? Making sure your child gets enough exercise can be difficult in the modern world. With an emphasis on digital technology coming further into our everyday lives, Gen Z could become the least active generation yet. British children reportedly spend an average of 3 hours per day playing video games online. The government recommendation for the minimum amount of exercise a person aged 5-18 should complete a day is 60 minutes. Physical activities should vary from favourites such as bike rides and bowling to strenuous competitive sports like football and rugby. However, NHS figures have revealed nearly 10% of children in UK first-schools are obese. It doesn’t have to be that way though and we can’t solely blame poor diets. Encouraging children to exercise is a guaranteed way to enhance their mood, confidence and health. Pilates is a great exercise for overweight children or children with low confidence as it is a slow and non-competitive exercise. Pilates help lessen the intimidating fears linked to group sports. It is also an excellent alternative to team sports and could be the solution to countering idleness and poor health. Where Does the Pilates Workout Originate? The techniques involved have a fascinating origin. The workout is named after the technique’s inventor, Joseph Pilates, a German physical trainer born in 1883. Joseph had an unfortunate childhood with ailments such as rickets, asthma and rheumatic fever causing him distress in his early years. An introduction to a scope of different exercises, including gymnastics, led Joseph to dedicating his life to producing his own unique workout routine. Pilates exercises are routed in countering poor posture, inefficient breathing and negative lifestyle choices. Joseph believed countering those three attributes can help lead a person to good health. 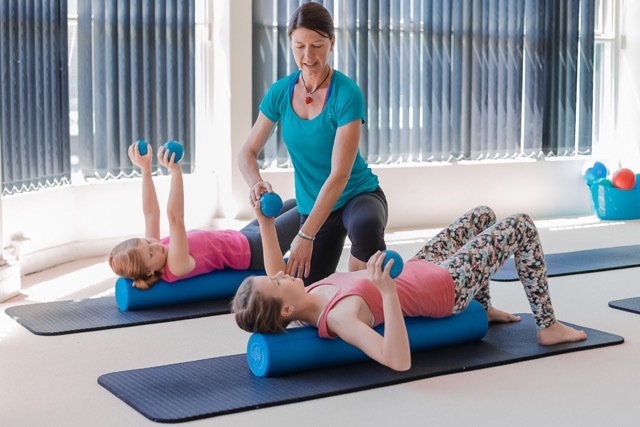 Suitable for all ages and abilities, Pilates exercises usually take place on a mat or specialised equipment and is a proven workout technique to emphasise focus on conditioning flexibility, posture, strength and balance. Children have little understanding or control over the lifestyle they yield, but incorporating Pilates into their lives can have a huge beneficial effect. Overly physical sporting activities such as football may not be suitable for some young children, with skeletal frames that have not yet developed and are therefore at risk. The low impact workout keeps joints properly functioning for adequate flexibility. A flexible body is important to undergo day to day activities, allowing streamlined movements and full bodily motions. Children who engage in Pilates increase their body’s flexibility and strengthen their core and trunk – the abdominal and inner muscles. Tendons become more limber and the body’s ability to circulate blood is also improved. Children will be able to drift off to sleep easier and the body’s capability to conserve energy will also increase. Athletic abilities aren’t just benefitted, however, as the increased energy allows for better concentration so children become more engaged in class. By captivating the power of Pilates, children can improve their spinal alignment and counter the negative effects brought on by activities which result in poor posture. The long-term impact of children undergoing regular Pilates exercises can be felt throughout their entire lives. Children will grow to be adults who are less receptive to injuries and more focused. Why not contact Physio Leeds today for more information? Alternately, learn more about Pilates for Children. Musculoskeletal – What Does It Mean? Are You Driving Yourself into Poor Posture? Myths Busted – Does Physiotherapy Hurt?